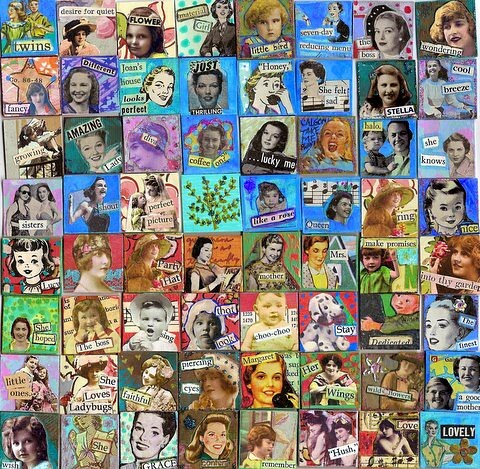 mosaic of all the 1 x 1's I've made thus far, originally uploaded by artjunkgrl. I finally organized the square family as 25 of them are going to be "adopted" into a swap. I hope they will find a good home. This will be the first parting, so I got them all together and did a mosaic and then separated them by color and loaded the groups on flickr. You can click on this photo and it will take you there if you want to see. I was NOT going to do this as it takes lots of time, but I figured I'd get them organized so I have a pic of what I've made. Now I'm going to take a square break for a bit and, like, clean my house and give my eyes a break from the eye strain! sigh. off I go. peace out. L.